I can finally, officially tell you my news! Herman & Rosie has been sold to a US publisher! My agent in New York ended up taking the book to auction where Neal Porter Books (Macmillan) won the rights to publish. Very exciting! There is a bit about it in Publishers Weekly here: (http:// us1.campaign-archive1.com/ ?u=d684790bedf89afe76e7b915 6&id=874e62f3f2&e=cf2ee82a e1) Will let you know US publishing dates when I get them. Huge thanks to my agent Charlie Olsen at Inkwell Management. Have been sitting on this for two weeks - couldn't hold it in much longer! Woah! It's been awhile huh - sorry. Well, my book, Herman and Rosie is in the bag, done and dusted. It is now doing the rounds overseas (I have some exciting news about this but can't tell you just yet!) So happy to have finally finished what has been a huge project for me - one that was both fun and exhausting. I don't want to crap on about the hours I put into this book but I can safely say that I have never spent as much time on one singular book. There is a little more about this in an interview I did over here at the Kids Book Review (KBR) site. Thankfully Penguin Australia were very patient (they were probably freaking out underneath but I'm glad they didn't let on!) I also worked with some really great people - my editor Katrina Lehman, my designer Tony Palmer and my publisher Laura Harris. These guys put in some hefty hours as well. 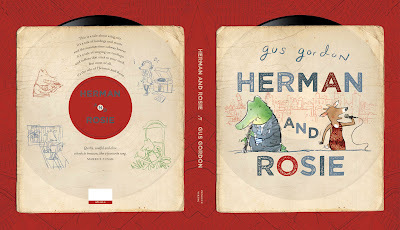 Herman and Rosie comes out in Australia and New Zealand in September and as far as elsewhere in the world, I will let you know soon - when they let me talk about it! Anyway it's done and I am allowed to show you the cover (above). Hope you like it.